Located in the heart of Kalbarri, this villa is within a 15-minute walk of Chinaman's Beach and Kalbarri Golf Club. Rainbow Jungle is 1.3 mi (2 km) away. Western Australia is known for its impressive beaches and natural landscapes, and the coastal town of Kalbarri is no exception. It’s located at the point where the 800km Murchison River meets the Indian Ocean. Amazingly, the town didn’t actually exist until 1951. Before that it was known simply as "the mouth of the Murchison" and home only to a handful of crayfishermen. Now it’s a popular tourist destination known for its relaxed atmosphere, coastal views and wildflowers. Kalbarri is in W.A’s Midwest and is a celebrated wildflower region, with more than 12,000 types blooming here from August to October. 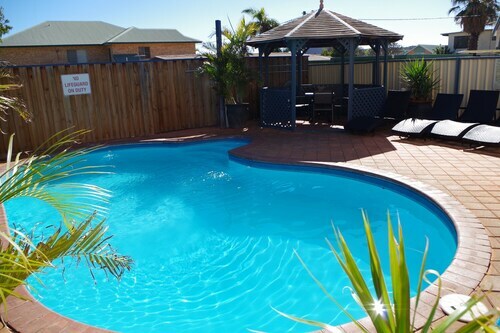 Pack your camera, grab your swimmers and save on your Kalbarri accommodation by booking with us! Surfers will be thrilled with the waves at Kalbarri’s beaches, especially in hotspots like Jacques’ Point. Kalbarri National Park has a number of gorges and rock formations, including "Nature’s Window", a red rock arch overlooking the river. Those who crave a good view can take a walk to the top of the Z-Bend lookout for a look at the gorge’s 150 metre plunge to the river. Other popular activities include bushwalking and picnicking, while thrill-seekers can abseil, rock climb, quad bike or skydive up to 14,000 feet with a beach landing. During wildflower season the park’s sandplains become a dazzling explosion of colour, with 60 per cent of the wildflowers found nowhere else on Earth! You can’t pick them, but you can take a colourful new Facebook profile picture or even try a guided wildflower tour. Close to the beach you’ll find restaurants, cafes and shops in the areas around Grey and Porter streets. Of course, plenty of fine seafood is on offer but you can also treat yourself to a nice coffee or burger. If you have kids, take them to Kalbarri Family Entertainment Centre where they can play mini-golf, bounce on bungy trampolines or climb through an 11-metre high tower constructed from rubber bands, known as "The Spider". A 60-minute car trip will take you to Pink Lake, where the water actually turns bright pink depending on the weather and time of day. Algae bloom beneath the lake’s surface and produce Beta Carotene, which gives the lake its funky colour. Kalbarri is about six hours from Perth by car or you can catch a TransWA or Greyhound bus. Wot are you waiting for? Book your Kalbarri accommodation with us and let your holiday bloom. How Much is a Hotel Room in Kalbarri? 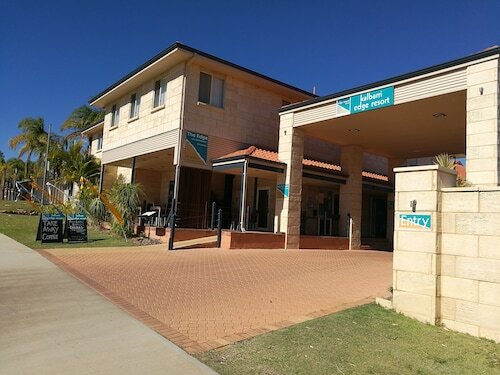 Hotels in Kalbarri start at AU$72 per night. Prices and availability subject to change. Additional terms may apply. Very spacious unit, very clean and tidy. IGA across the road and a nice walk into town. 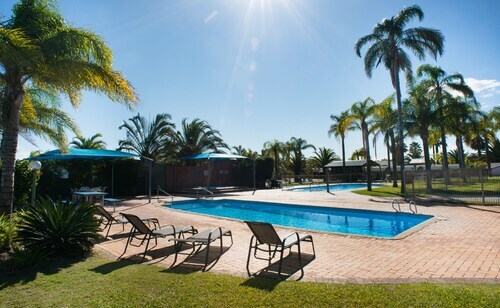 Just a great place to stay, friendly staff, good parking facilities, very roomy accommodation.